A crying cub and a lullaby bring some old friends together again. He had walked through the Holt with his little daughter for nearly an hour by now. But Glow was still crying with might and main. Her head, the only part of her that poked out of the thick furs she was wrapped into, had already turned bright red in effort. He had taken her from an exhausted Chicory after she had been fed, and since then his little girl had not stopped crying. To make sleeping easier for his Recognized he had taken Glow outside. But even before he had left the den, Chicory was already deeply asleep. Since Glow's birth eight days ago, Rainpace and Chicory had not had a quiet moment. They even started to take shifts because their cub never slept more than a brief wolf-nap. Due to his own distorted sleeping rhythm, Rainpace did not mind resting for short periods of time. He compensated for that by taking long naps three times a day. But Glow�s sporadic and brief periods of sleep were hard on Chicory, especially during the daytime. Now it was early morning and the stars were already fading. Caring for their child during the day was most often his job. He walked through the morning mist that enwrapped the Craft-trees and rocked his still crying cub softly while continuously whispering soothing words. Rainpace jumped and whirled around to see Windsong and her wolf-friend appearing out of the mist. �I�ve been listening to her wailing since I passed Den's Creek.� She smiled at him and came closer, bow and arrow case over her shoulder. Two dead rabbits hung from her belt. Obviously she had been hunting � successfully. �I didn�t hear you approaching. As you said, she has a voice.� Rainpace gave her a lopsided grin. Rainpace gave her a pained look in response that spoke volumes. It made her giggle. �And it seems as if she inherited some of your oddities as well,� she teased and nodded in the direction of the rising sun. His being often awake during daytime had earned him some shaking heads before. Grinning, he just shrugged in response. �May I?� Windsong asked, offering her hands to take over the crying cub. Rainpace laid Glow into the huntress's arms, relieved to unburden his own for a while. But his daughter did not seem to like it. Her wailing intensified. Windsong cradled the cub and started humming some random notes. Slowly the notes became a melody. The intensity of her voice constantly grew. Finally, she was singing a familiar lullaby. Although she sang quietly, her rich, vibrant voice rose over the mist and the rivers and mixed with the sparse singing of the awakening birds. Rainpace's fingers itched for his flute. He was not the only one mesmerized by the song. Glow had stopped wailing and now stared with her big, amber-golden eyes at Windsong, her pouting mouth slightly open, in surprise. After a while her eyes became heavy and Rainpace could tell that his daughter was fighting against sleep. But when Windsong let the last note die away, Glow had lost the fight. Windsong fondly looked down at the sleeping bundle in her arms. �She really is a beautiful cub,� she whispered. Rainpace could not help that pride filled his chest. When Windsong looked up at him his feelings were mirrored in his face by a broad, sheepish grin. Only a few seasons ago those blue eyes would have been filled with a mischievous or flirtatious sparkle. But now she could only see overflowing love and caring for his daughter. 'Funny how cubs change people,' the huntress mused while remembering her own feelings during the first days with newborn Sweetvine. Windsong carefully handed the cub back to Rainpace and they slowly walked into the direction of the Dentrees. Thumper trailed behind them, obviously still hoping to get a bite of Windsong's prey. Bristlepelt emerged from the bushes, too. Without Glow's noisy crying, the wolf sought Rainpace's attention again. �That was a neat trick of yours,� he said to Windsong while scratching Bristlepelt behind her ears with his free hand. �Well, it had worked quite often before.� she shrugged. �Could you imagine any other way to get Crackle lay still for more than two breaths?� Affection rang in her voice, but also a bittersweet melancholy. Crackle was too old for lullabies now. Cubs grew so fast. �Or Notch and me, way back when,� Rainpace interrupted her thoughts. He had finally remembered the song, and also the reason why Windsong had been one of his favourite cubsitters when he was a cub himself. �I'm afraid I must tell you it took more than a lullaby to handle the both of you... mostly.� Around Rainpace her smile always popped up so easily. �I thought so,� he cheerfully agreed. 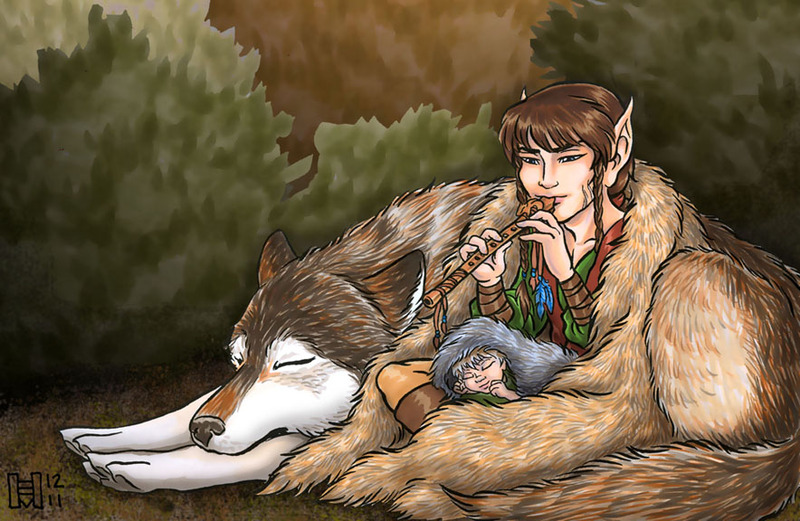 �Speaking of Notch, I hope you let him endure the pains of cubsitting from time to time, as well.� Windsong greatly enjoyed the merry fooling around with the trapper. But Rainpace's grin slowly disappeared at her question and he looked away. The lightness of their conversation was gone. �I haven't seen him much lately,� he finally said, not able to completely hide his hurt feelings. Surprised that she had hit a sore spot, Windsong nevertheless sensed that Rainpace did not want to go into it any further. She watched the trapper and the child in his arms. Change indeed, she thought. And sometimes new things replace old ones. They walked in silence, both lost in their own thoughts and content with not speaking. When they reached the Dentrees, Rainpace turned to Windsong with his usual smile again. �Thank you for your help with this little kitten here.� He gave the bundle in his arms an affectionate squeeze. �Thank you for giving me opportunity to do so. I definitely sing too seldom these days,� Windsong regretfully confessed. Rainpace gave Bristlepelt a last pat on the head and waved good-bye to the huntress while he climbed the stairs to Chicory's den. Windsong briefly looked after him and set off to the store-dens. Meeting Rainpace had made her forget how tired and cold she was. Now she was really looking forward to her own furs that were hopefully pre-warmed by Suddendusk. The frozen grass crunched quietly under Thumper's paws. Windsong returned from one of her solo hunting trips and again the first sights of approaching morning were already visible. This time she did not have any luck, but the hunt itself had left her content and balanced. When she reached the Craft-trees, her ears caught a faint melody. Steering Thumper in the direction of the music, she realized soon that someone was playing the flute. Smiling, she thought she knew who the player was, and indeed, when she rounded the next tree, she saw Rainpace sitting on the ground wrapped in thick furs. For further warmth on this chilly morning, Bristlepelt had laid herself around him. She slowly approached them not wanting to startle the trapper. But Rainpace had already sensed her. He ended the song and smiled up at her. �Seems it works as well with the flute,� he said. Puzzled, Windsong gave him a questioning look. He opened the furs around him a bit and the huntress caught a glimpse of a sleeping Glow in his lap. A blissful smile had crept onto the little face. Rainpace invitingly opened the furs further. �Shall we find out if we could make her sleep for days and days in a row?� He winked at her. Windsong climbed down from Thumper's back and accepted the invitation. They huddled close and wrapped the furs tightly around them. Then Rainpace started to play the lullaby she had sung several days back. After listening a while she joined in. While they played together the sun slowly rose above the river mist.